Celebrate the season with us and see the new jewelry, just in. 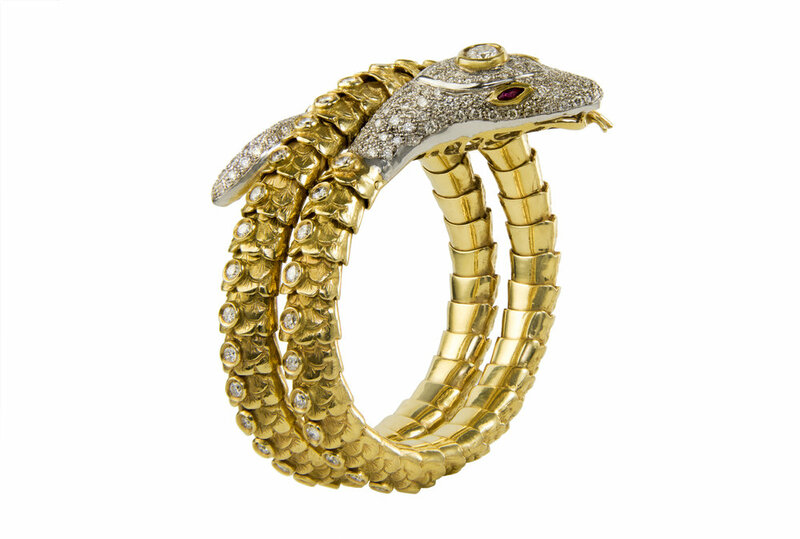 Paolo Spalla was an Italian goldsmith and sculptor, who began creating jewelry in 1960. Spalla lived and worked on the River Po in northern Italy and often incorporated stones from the river into his unique jewels. We have diamonds on the mind, and rightly so - diamonds are the birthstone for April. To shine, diamonds don't always have to be the center of attention. We particularly love their use in this bold, geometric 18k gold bombe ring with slices of pave diamonds placed in the interior cut-outs of the design. A diamond and 18k gold geometric cut out ring, c. 1980s. Size 7. As Emily Dickinson famously wrote, “The heart wants what it wants.” Let us all celebrate love and caring this month and throughout the year. Our featured piece this month is this unusual hammered gold cuff, based on the myth of Vulcan’s forge. The offspring of Jupiter and Juno, Vulcan was the god of fire and volcanoes, whose forge stands beneath Mt. Aetna, in Sicily. In Greek mythology, this mighty metal smith created not only shields and armor, but also fantastic jewels, and is often shown with hammers and anvils, and other tools of his trade. Velázquez and Tintoretto painted Vulcan. Giorgio Vasari made masterly drawings and also painted him. Closer to our cuff is the Venetian, Palma Giovane’s, painting “Venus and Cupid at Vulcan’s Forge” (1610). On our bracelet putti, little cherubs, toil as Vulcan’s able assistants, perhaps helping him make a necklace for his mother or a bracelet for his wife, Venus.